Talmudist and poet of the eleventh century; author of the "Leḳaḥ Ṭob" or "Pesiḳta Zuṭarta," a midrashic commentary on the Pentateuch and the Five Megillot. Zunz ("G. V." pp. 293 et seq.) inferred from Tobiah's reference to his father as "the great" and from his mention of the massacre in Mayence in 1096, that he was a native of Mayence and a son of Eliezer b. Isaac ha-Gadol, who is thought by Conforte ("Ḳore ha-Dorot," p. 8b) to have been one of Rashi's teachers. But as in the course of his work Tobiah often attacks the Karaites and, besides, manifests a thorough knowledge of Mohammedan customs, Rapoport, in his biography of Ḳalir, note 33 (in "Bikkure ha-'Ittim," x. 122-123), concluded that toward the end of his life Tobiah settled in Palestine. 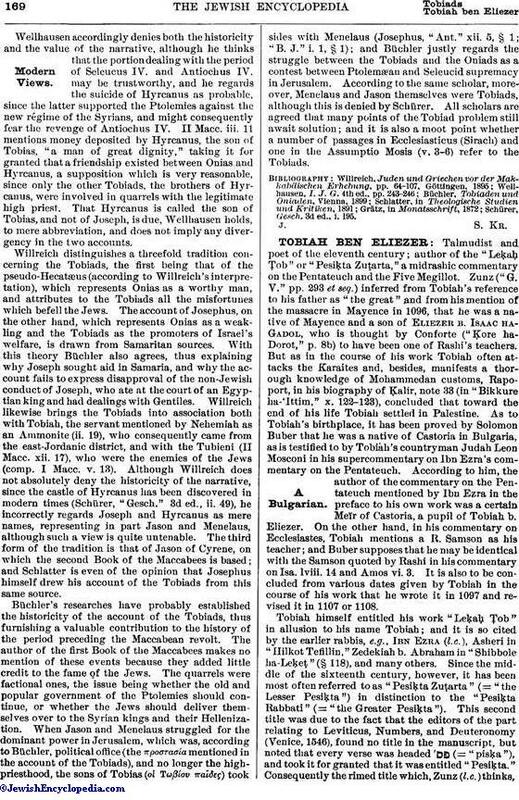 As to Tobiah's birthplace, it has been proved by Solomon Buber that he was a native of Castoria in Bulgaria, as is testified to by Tobiah's countryman Judah Leon Mosconi in his supercommentary on Ibn Ezra's commentary on the Pentateuch. According to him, the author of the commentary on the Pentateuch mentioned by Ibn Ezra in the preface to his own work was a certain Meïr of Castoria, a pupil of Tobiah b. Eliezer. On the other hand, in his commentary on Ecclesiastes, Tobiah mentions a R. Samson as his teacher; and Buber supposes that he may be identical with the Samson quoted by Rashi in his commentary on Isa. lviii. 14 and Amos vi. 3. It is also to be concluded from various dates given by Tobiah in the course of his work that he wrote it in 1097 and revised it in 1107 or 1108. 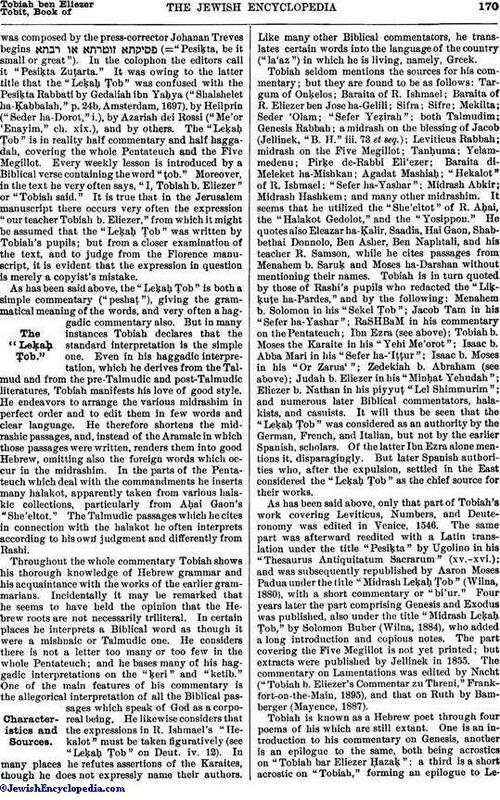 Tobiah himself entitled his work "Leḳaḥ Ṭob" in allusion to his name Tobiah; and it is so cited by the earlier rabbis, e.g., Ibn Ezra (l.c. ), Asheri in "Hilkot Tefillin," Zedekiah b. Abraham in "Shibbole ha-Leḳeṭ" (§ 118), and many others. Since the middle of the sixteenth century, however, it has been most often referred to as "Pesiḳta Zuṭarta" (= "the Lesser Pesiḳta") in distinction to the "Pesiḳta Rabbati" (= "the Greater Pesiḳta"). This second title was due to the fact that the editors of the part relating to Leviticus, Numbers, and Deuteronomy (Venice, 1546), found no title in the manuscript, but noted that every verse was headed (= "pisḳa"), and took it for granted that it was entitled "Pesiḳta." Consequently the rimed title which, Zunz (l.c.) thinks,was composed by the press-corrector Johanan Treves begins (="Pesḳta, be it small or great"). In the colophon the editors call it "Pesiḳta Zuṭarta." It was owing to the latter title that the "Leḳaḥ Ṭob" was confused with the Pesiḳta Rabbati by Gedaliah ibn Yaḥya ("Shalshelet ha-Ḳabbalah," p. 24b, Amsterdam, 1697), by Heilprin ("Seder ha-Dorot," i. ), by Azariah dei Rossi ("Me'or 'Enayim," ch. xix. ), and by others. The "Leḳaḥ Ṭob" is in reality half commentary and half haggadah, covering the whole Pentateuch and the Five Megillot. Every weekly lesson is introduced by a Biblical verse containing the word "ṭob." Moreover, in the text he very often says, "I, Tobiah b. Eliezer" or "Tobiah said." It is true that in the Jerusalem manuscript there occurs very often the expression "our teacher Tobiah b. Eliezer," from which it might be assumed that the "Leḳaḥ Ṭob" was written by Tobiah's pupils; but from a closer examination of the text, and to judge from the Florence manuscript, it is evident that the expression in question is merely a copyist's mistake. As has been said above, the "Leḳaḥ Ṭob" is both a simple commentary ("peshaṭ"), giving the grammatical meaning of the words, and very often a haggadic commentary also. But in many instances Tobiah declares that the standard interpretation is the simple one. Even in his haggadic interpretation, which he derives from the Talmud and from the pre-Talmudic and post-Talmudic literatures, Tobiah manifests his love of good style. He endeavors to arrange the various midrashim in perfect order and to edit them in few words and clear language. He therefore shortens the mid-rashic passages, and, instead of the Aramaic in which those passages were written, renders them into good Hebrew, omitting also the foreign words which occur in the midrashim. In the parts of the Pentateuch which deal with the commandments he inserts many halakot, apparently taken from various halakic collections, particularly from Aḥai Gaon's "She'eltot." The Talmudic passages which he cites in connection with the halakot he often interprets according to his own judgment and differently from Rashi. 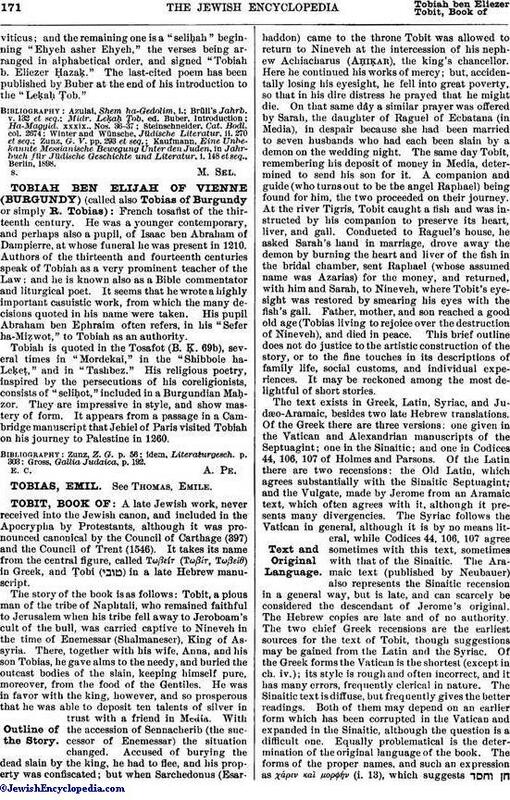 Throughout the whole commentary Tobiah shows his thorough knowledge of Hebrew grammar and his acquaintance with the works of the earlier grammarians. Incidentally it may be remarked that he seems to have held the opinion that the Hebrew roots are not necessarily triliteral. In certain places he interprets a Biblical word as though it were a mishnaic or Talmudic one. He considers there is not a letter too many or too few in the whole Pentateuch; and he bases many of his haggadic interpretations on the "ḳeri" and "ketib." One of the main features of his commentary is the allegorical interpretation of all the Biblical passages which speak of God as a corporeal being. He likewise considers that the expressions in R. Ishmael's "Hekalot" must be taken figuratively (see "Leḳaḥ Ṭob" on Deut. iv. 12). In many places he refutes assertions of the Karaites, though he does not expressly name their authors. Like many other Biblical commentators, he translates certain words into the language of the country ("la'az") in which he is living, namely, Greek. Tobiah seldom mentions the sources for his commentary; but they are found to be as follows: Targum of Onḳelos; Baraita of R. Ishmael; Baraita of R. Eliezer ben Jose ha-Gelili; Sifra; Sifre; Mekilta; Seder 'Olam; "Sefer Yeẓirah"; both Talmudim; Genesis Rabbah; a midrash on the blessing of Jacob (Jellinek, "B. H." iii. 73 et seq. ); Leviticus Rabbah; midrash on the Five Megillot; Tanḥuma; Yelammedenu; Pirḳe de-Rabbi Eli'ezer; Baraita di-Meleket ha-Mishkan; Agadat Mashiaḥ; "Hekalot" of R. Ishmael; "Sefer ha-Yashar"; Midrash Abkir; Midrash Hashkem; and many other midrashim. It seems that he utilized the "She'eltot" of R. Aḥai, the "Halakot Gedolot," and the "Yosippon." He quotes also Eleazar ha-Ḳalir, Saadia, Hai Gaon, Shabbethai Donnolo, Ben Asher, Ben Naphtali, and his teacher R. Samson, while he cites passages from Menahem b. Saruḳ and Moses ha-Darshan without mentioning their names. Tobiah is in turn quoted by those of Rashi's pupils who redacted the "Liḳḳuṭe ha-Pardes," and by the following: Menahem b. Solomon in his "Sekel Ṭob"; Jacob Tam in his "Sefer ha-Yashar"; RaSHBaM in his commentary on the Pentateuch; Ibn Ezra (see above); Tobiah b. Moses the Karaite in his "Yehi Me'orot"; Isaac b. Abba Mari in his "Sefer ha-'Iṭṭur"; Isaac b. Moses in his "Or Zarua'"; Zedekiah b. Abraham (see above); Judah b. Eliezer in his "Minḥat Yehudah"; Eliezer b. Nathan in his piyyuṭ "Lel Shimmurim"; and numerous later Biblical commentators, halakists, and casuists. It will thus be seen that the "Leḳaḥ Ṭob" was considered as an authority by the German, French, and Italian, but not by the earlier Spanish, scholars. Of the latter Ibn Ezra alone mentions it, disparagingly. But later Spanish authorities who, after the expulsion, settled in the East considered the "Leḳaḥ Ṭob" as the chief source for their works. As has been said above, only that part of Tobiah's work covering Leviticus, Numbers, and Deuteronomy was edited in Venice, 1546. The same part was afterward reedited with a Latin translation under the title "Pesiḳta" by Ugolino in his "Thesaurus Antiquitatum Sacrarum" (xv.-xvi. ); and was subsequently republished by Aaron Moses Padua under the title "Midrash Leḳaḥ Ṭob" (Wilna, 1880), with a short commentary or "bi'ur." Four years later the part comprising Genesis and Exodus was published, also under the title "Midrash Leḳaḥ Ṭob," by Solomon Buber (Wilna, 1884), who added a long introduction and copious notes. The part covering the Five Megillot is not yet printed; but extracts were published by Jellinek in 1855. The commentary on Lamentations was edited by Nacht ("Tobiah b. Eliezer's Commentar zu Threni," Frankfort-on-the-Main, 1895), and that on Ruth by Bamberger (Mayence, 1887). Tobiah is known as a Hebrew poet through four poems of his which are still extant. One is an introduction to his commentary on Genesis, another is an epilogue to the same, both being acrostics on "Tobiah bar Eliezer Ḥazaḳ"; a third is a short acrostic on "Tobiah," forming an epilogue to Leviticus;and the remaining one is a "seliḥah" beginning "Ehyeh asher Ehyeh," the verses being arranged in alphabetical order, and signed "Tobiah b. Eliezer Ḥazaḳ." The last-cited poem has been published by Buber at the end of his introduction to the "Leḳaḥ Ṭob." Kaufmann, Eine Unbekannte Messianische Bewegung Unter den Juden, in Jahrbuch für Jüdische Geschichte und Literatur, i. 148 et seq., Berlin, 1898.